Disappointingly Grimsby Town Scholarship opened an under 16 tournament same night as the Grimsby Futsal League. Two teams from GFL u15s league migrated mid season to the GTFC League. Meglio paid their dues and left, Grimsby Phoenix did not pay the outstanding dues; they just upped and went; from my angle shocking bad manners. The Grimsby Futsal League has played for twenty years, during that time I have never done anything that would conflict with another established football or futsal league. The demise of Meglio and Phoenix opened the league into a whole new contest; mid table Healing grasped their opportunity, week by week gaining points on Galacticos and Futsal All Stars and with two games to play sat top of table. Six wins in last seven games tells its own story. Futsal All Stars run was damaged by player availability. Galacticos had a great run in but was damaged by one win in six mid season. Grimsby Borough United had a win and a loss season; hampered by not having a regular keeper. Clee Town Reds had a great season; and could yet finish third, if they can win last game. The bottom two teams both made admirable contributions to the league, both closing gap on opposition in later matches. The games between the two teams were a pleasure to referee. The under 15s was only league to trial the ‘FA Power Play’ rule. I have spoken to all teams; in every conversation I was told ‘it had benefited matches’. The follow on league will be an Under 16’s League to bring competition into line with FA Futsal Youth Cup. 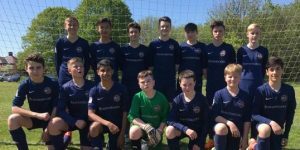 This entry was posted in Grimsby Futsal League on February 9, 2019 by Kevin Bryant.